Dan Walsh’s large scale paintings exude a quirky brand of minimalism. 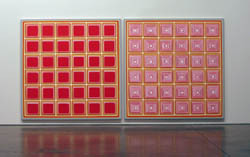 In Red Diptych II Walsh presents two canvases of grid patterns contrived of the same palette: the left panel comprised of solid blocks, the right of concentric tiles. Using the multiplicity of this geometric form, Walsh’s paintings construct a phantasmal architecture: their componentised repetition suggests infinite expansion, each square mesmerising with the hypnotising glow of electric transmission. Creating optical illusions of gravity and weightlessness, Walsh’s paired canvases alternate in their perspectival deception as their flat surfaces appear to advance and recede simultaneously. 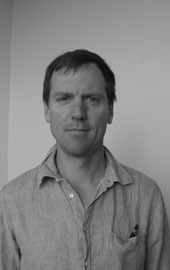 Dan Walsh’s work resounds with an understated authority. Painted with a pristine delicacy, Walsh’s Arrangement uses the solidity of the chequered composition to create an abstracted sense of space. Divided by a liminal grid of translucent dark lines, his squares are bordered with concentrated bands of intense warm colour, weighted at their bases with striations of steely blue. Rendered by hand, Walsh’s geometric composition waivers with faint imperfection: Seemingly straight edges subtly bow and warp with undulating movement, creating a tessellated field of reverberant disorientation. Rendered in brown, black, and white, the patterning in Walsh’s Auditorium is reminiscent of ancient Grecian pottery in its colouration and geometric motifs, and the bands around the edges give the effect of an architectural floor plan with the linear borders and rounded rectangles suggesting stairs and columns or chambers. Walsh uses the authority of these classical references to engage with ideas of visual purity. 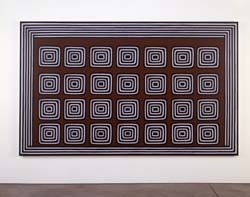 Painted entirely freehand, without the use of a ruler or masking tape, the graphic perfection of his composition is conceived as subjective perception, as the asymmetrical layout defies spatial logic and the subtle idiosyncrasies of Walsh’s brush marks infuse design archetype with the friability of human negotiation. 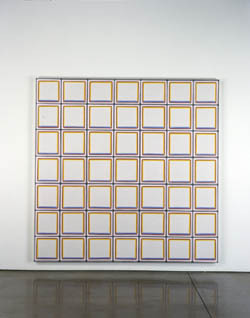 Group Exhibition, Paula Cooper Gallery, New York. Architecture & Memory, Lawrence Rubin Greenberg Van Doren Fine Art, New York. Larry Clark Portfolios, Galerie Max Hetzler, Berlin, Germany. Painting as Paradigm, Stark Gallery, New York.